For some of us, surfing the internet on our Smartphones still looks annoying especially on those smaller screen devices, but how would you feel if you were to browse the internet on a smaller device like the Samsung Gear S which has just 2 inch display ? You'll probably feel comfortable since it's all on your wrist. Right ? 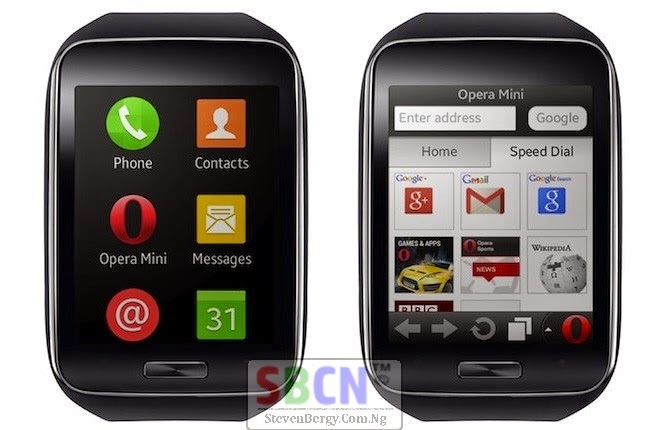 FYI, Opera mini is the first web browser application to find its way to the Tizen-based watch, allowing you to browse the internet on your wrist with great features like mobile compression (that shrinks pages to as little as 10% of their original size) and speed dial with your recent pages just as it is available on the Mobile Phone version of Opera Mini. The Opera Mini browser for the Samsung Gear S also has a Smart Page that aggregates social updates and news on one screen. You can change between Smart Page and Speed dial with a tap of the finger. You can download the Opera Mini browser on your Gear S for free through the Samsung Gear Apps store. If you're yet to see the Specs, Features, Review and the Official Introduction video of the Samsung Gear S, you can check it in the links below. I must tell you, the Samsung Gear S is a smartwatch so smart enough to get the most valuable updates and info you need directly on your wrist.